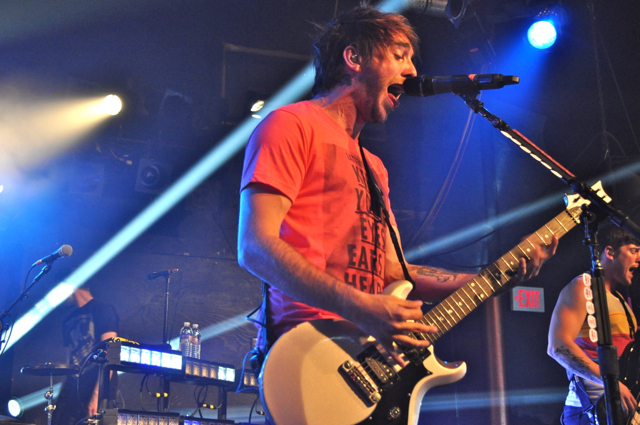 All Time Low brings complexity to “Don’t Panic” – Live! Starring ... You! Alex Gaskarth and All Time Low released their fifth full-length album, “Don’t Panic,” this fall. The album, which debuted at No. 6 on the Billboard 200, is a fast-paced and catchy record that stands out from ATL’s previous four albums while retaining the band’s hopeful, pop-rock sound. Although All Time Low’s lyrics can at times be somewhat simple – “Gimme, gimme my motivation. Gimme, gimme my dreams…you gotta let me be me” – they are no doubt relatable, which is what has made All Time Low fans feel so connected to the band. Something that stood out on “Don’t Panic” was the improved instrumentation compared to the band’s past releases. All Time Low’s songs have always been catchy, but the songs on “Don’t Panic” are more complex instrumentally which makes the listening experience more interesting and shows that the band has improved over the years. I’m twice the man that I was yesterday. On the face of a town that could not get me to stay. The song is about making your mark in the world. For All Time Low, this means impacting the pop-rock genre in a positive way and leaving music behind that will be remembered for a long time to come. Patrick Stump knows from experience that talent and perseverance can help any small town band achieve huge success. The album’s opener “Long Live the Reckless and the Brave” has a very inspirational sound with lyrics about leaving behind those who don’t believe in you in order to make something of yourself. Another highlight of the album is “So Long Soldier,” a song about Alex’ move from the UK to the United States when he was a child. The song features Anthony Raneri of Bayside on vocals and is fast and intense from the very beginning. The guitar riff at the beginning of the song doesn’t really sound like any other songs on the record. I happen to be a sucker for the cheesy lyrics, so two of my favorites on the album are “Backseat Serenade” and “If These Sheets Were the States.” The former is about rekindling a lost love while the latter is about dealing with the emotional stress that accompanies a long distance relationship. Other highlights include “For Baltimore,” an homage to the band’s hometown, and “Somewhere in Neverland”. “Don’t Panic” definitely has its high points. It is a catchy, well-written album that is ATL’s best to date. The band’s improvement is obvious, but they have not strayed too far from the sound that first put them on the map. This is the ATL album that can turn skeptics into fans. I joined front man Alex Gaskarth on ATL’s tour bus to get the story behind “Don’t Panic.” Here are some hightlights, or watch the video at the bottom of the page to see the full interview. Click here to read Mary’s interview with ATL from Vans Warped Tour 2012. I’m more than happy to discover this page. I want to to thank you for your time due to this fantastic read!! I definitely liked every little bit of it and i also have you book-marked to look at new things in your website.